There are about 50 triad groups that are active in modern Hong Kong; many of them are no more than small, local street gangs. The larger groups, including the Sun Yee On, Wo Shing Wo and 14K, are syndicates of sophisticated criminals, mirror images of such similar western empires of crime as the mafia. Their activities include drug trafficking, money laundering, illegal gambling, prostitution, car theft and other forms of racketeering. A major source of triad income today comes from the counterfeiting intellectual property such as computer software, music CDs and movie VCDs/DVDs. They also trade in bootleg tobacco products. The Triads were started as a resistance to the Manchu Emperor of the Qing Dynasty. In the 1760s, a society called the Tian Di Hui (Heaven and Earth Society) was formed in China. Its purpose was to overthrow the Manchu-led Qing Dynasty and restore Han Chinese rule. As the Tiandihui spread through different parts of China, it branched off into many groups and became known by many names, one of which was "Sanhehui" (Chinese: ä¸‰å�ˆæœƒ; Hanyu Pinyin: sÄ�nhÃ©huÃ¬; Yale Cantonese: saam1 hap6 wui2), literally "Three Harmonies Society", referring to the unity between Heaven, Earth, and Man. These societies accordingly made use of the triangle in their imagery. The name "triad" was coined by British authorities in Hong Kong, referring to that use of triangular imagery. Over several centuries, what is known as triads today developed from a patriotic society to a criminal organization. Following the overthrowing of the Qing Dynasty of China in 1911, the Hung clan (æ´ªé–€) suddenly found themselves lost without purpose. Worse still, they somehow managed to miss out on the opportunity to participate in the actual uprising, and many of them were left angry and depressed. Unable to revert to normal civilian lives after spending years living under outlawry, grave danger and extreme violence, many ex-rebels reunited to form a cult which later came to be known as the Triad. Having lost the usual donations and support from the public after the collapse of the Qing empire, members of the newly formed cult resorted to money extortion from the unwilling public through all possible means. When the Communist Party of China took power in 1949, Mainland China was put under strict law enforcement and organized crime diminished. Triad members then migrated south to the then-British crown colony of Hong Kong for the continuance of their business. 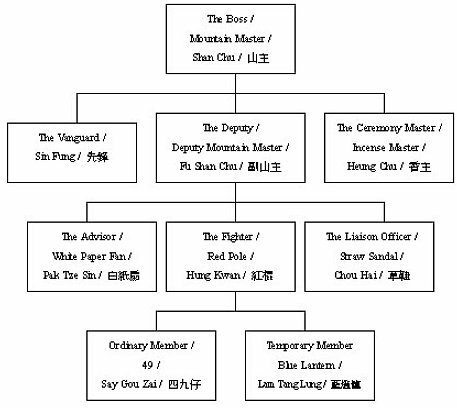 By 1931, there were eight main triad groups and they had divided Hong Kong up into geographic areas and ethnic groups that each group was responsible for controlling. The eight main ones at that time were the Wo, the Rung, the Tung, the Chuen, the Shing, the Fuk Yee Hing, the Yee On, and the Luen. Each had its own headquarters, its own sub-societies, and its own public covers. After the Riot in Hong Kong in 1956, the government actively enforced the laws that restricted and diminished the Triad activities in Hong Kong.